In 1950 the little town in the redwoods - Felton, CA - had a population of about 1200 residents, including 38 Catholic families. The nearest church was in Santa Cruz. From 1929-38 they went to Masses held in the Felton home of retired Fr. P.D. Hassett. 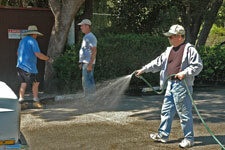 Masses were held during the summer months at campgrounds by priests from Alma College in Los Gatos. Beginning in 1947 Fr. John Nelson from St. Vincent de Paul in Davenport said Mass in the Felton Community Hall, the "church" for six years. In 1951 the Catholic families formed a committee for the purpose of building a church. Land was purchased in August 1951, and construction began in September. 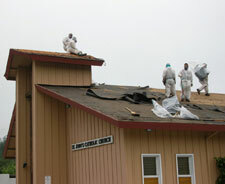 Parishioners pledged more funds, sought donated materials, and borrowed money from St. Patrick's in Watsonville. Benefactors included Catholic and non-Catholic friends of the parishioners. By 1955 the parish was out of debt. Irish-born Fr. William Lane arrived in March 1952 with the commission of finishing the church. The glorious Easter Sunday of April 5, 1953 was celebrated with St. John's first Mass in its brand new church, its altar surrounded with white flowers. In 1955 Fr. Lane transferred to Pacific Grove, to be replaced by Fr. Edward Haskins. Fr. Haskins saw significant growth in the parish, and established the Newman Club for high school students. He was forced to resign in 1963, due to poor health. Fr. Patrick McHugh (also Irish-born) arrived in 1963. During his tenure meetings and religious education classes continued to be held in the homes of parishioners, but it soon became obvious that St. John's needed more space. He oversaw the purchase of land adjoining the church in 1969, and the hall was built soon after. Fr. McHugh died of a heart attack in the rectory in March 1979. Msgr. John Kennedy (the third Irish-born pastor) arrived to spend 17 years-the longest of all pastoral tenures. He put on no airs about the use of his clerical rank, preferring to be called "Father" Kennedy, and protested the naming of the garden behind the rectory as "Kennedy Pavilion". He retired in 1996 and moved to a house in Felton. He died in 2002 and is buried in the Felton Cemetery, just up the hill. Msgr. Kennedy was pastor during 1982, when the San Lorenzo River overran its banks and caused devastation in the valley. He turned the hall over to the American Red Cross for use as a shelter. Msgr. 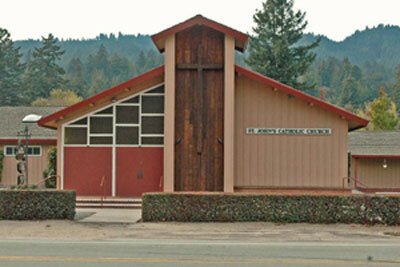 Kennedy was also pastor during the 1989 Loma Prieta earthquake, which damaged the facade of the church. He commissioned local artist Cliff Short to create a 16-foot redwood cross etched with vines, 12 grape clusters, and the eagle symbol of St. John the Evangelist, for the front of the building. When Fr. Michael Cross arrived in 1996, Msgr. Kennedy told him the little parish in the redwoods would "grow on him like moss". As part of the 50th Anniversary celebration in 2002, Fr. Cross commissioned Cliff Short to create a new altar, ambo, and tabernacle base, all in redwood. To better show off the Crucifix behind the altar, light-colored stonework was applied to the wall. A new sand colored carpet spreads along the aisles and under the ranks of freshly polished pews where, down five decades, sat so many of the now departed parishioners who helped realize the dream of turning a corner vacant lot into a House of Worship.